Summer brings with it fun days at your favorite seaside beach and people of all ages playing in the ocean. But the fun can end quickly if you or someone you’re with gets stung by a jellyfish. Jellyfish are a common sea creature, and several species of jellyfish carry poisonous venom in their tentacles as a means of self-defense against predators. When you come in contact with a jellyfish tentacle, it can cause millions of nematocysts to pierce the skin and inject venom. It’s this venom that makes a jellyfish sting so painful. According to the National Science Foundation, 200,000 people are stung by jellyfish every year in Florida alone and 150 million people worldwide are exposed to jellyfish each year. 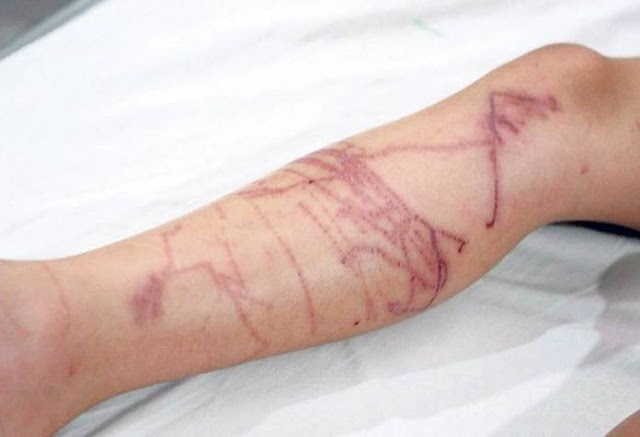 Some common symptoms of a jellyfish sting are burning, stinging and itching sensations on the skin; a tingling or numbness where the sting occurred; throbbing pain that radiates up a leg or an arm; and the skin in the area of the sting turning red or purple. At times, one may experience severe symptoms like nausea, dizziness, vomiting and difficulty breathing. In such a case, immediate medical attention is required or it can become fatal. The severity of the symptoms depends on the type of jellyfish that stings you and the number of nematocysts in your skin. The two most dangerous types of jellyfish are the box and the Irukandji jellyfish, both of which are only found in the Pacific Ocean near Australia. Most jellyfish stings get better with home treatment. In fact, there are many simple and effective remedies that can help remove the venom and provide quick relief from the symptoms. As soon as you know that you’ve been stung by a jellyfish, do not panic and get out of the water as calmly as possible. Seek land to avoid being repeatedly stung, which can make things really bad. As you get out of the water, do not scratch the sting-site or touch it with your hands. When touched with bare hands, the tentacles that may still be attached to your skin will only get you stung more. Once you are in a safe area, rinse the sting with sea water to wash away any clinging tentacles or stinging tissue. Do not use fresh water, it is believed to activate the nematocysts. Avoid rubbing the area with a towel after rinsing, as this can activate any remaining stingers. After leaving the water and rinsing the site of the sting with sea water, the next step is to immediately rinse it with vinegar. White vinegar should reduce the pain and deactivate the toxin. A 2017 study published in Toxins concludes that rinsing with vinegar before applying heat is the most effective treatment for jellyfish stings. 1. Rinse the affected area with vinegar for at least 30 seconds. 2. Carefully pluck out visible tentacles with a fine tweezers. Do not touch the tentacles directly! 3. Soak the skin in hot water that is between 110° and 113° F (43° to 45° C). Keep the affected skin immersed or in a hot shower for 20 to 45 minutes. If the vinegar feels too strong, you can dilute it with salt water. Do not use fresh water to dilute it, as this will irritate the stings even more. After the initial treatment, a hot water immersion is highly recommended. The high temperature will help deactivate the venom and help decrease the burning sensation from the sting. A 2006 study published in the Medical Journal of Australia reports that immersion in water at 113° F (45° C) for 20 minutes is an effective and practical treatment for pain from bluebottle jellyfish stings. 1. Heat a few cups of water to between 110° and 113° F (43° to 45° C). 2. Put some salt in the water and stir well. 3. Soak the affected area in the salt water for 10 minutes at a time. After the initial treatment is done, you can use a cold compress to reduce pain and swelling. The cold temperature has a numbing effect, which helps reduce the sensation of pain. It will also reduce swelling and inflammation by numbing the nerves. · Wrap some ice cubes in a thin cloth. Apply this compress on the affected area for 10 minutes. Take a break and repeat if needed to reduce pain. · Soaking the affected area in cool water may also help. Repeat as needed. Caution: Never put ice directly on the skin, as it can cause frostbite. To neutralize the nematocysts and their venom, you can also use baking soda. It acts as a natural acid neutralizer that helps reduce the effect of the jellyfish’s venom. This in turn lessens the itching as well as the risk of infection. Plus, being an anti-inflammatory agent, it helps reduce swelling, inflammation and redness. 1. Mix 1 teaspoon of salt with 3 tablespoons of baking soda. 2. Add 1 cup of sea water to the mixture to form a paste. 3. Apply this paste on the affected area. 4. Let it sit for 5 minutes, then rinse it off with sea water. 5. Repeat twice per day to get the best results. Aloe vera contains excellent anti-inflammatory properties that can help reduce swelling, inflammation and pain that you may experience due to jellyfish stings. It will also effectively work to soothe your skin, as well as preventing the itchy sensation from occurring in the skin. · Extract the gel from a freshly rinsed aloe vera leaf. Apply it on the affected area. Leave it on for a few hours, then rinse it off with lukewarm water. Use this remedy 2 or 3 times daily. · You can even freeze aloe vera gel in an ice cube tray and use the frozen cubes as a cold compress. Apply it on the site of the sting a few times a day. For any kind of itching and inflammation, oatmeal is a very effective home remedy and it can obviously be used to deal with jellyfish stings. 1. Add 2 cups of colloidal oatmeal to a bathtub filled with lukewarm water and stir thoroughly. 2. Soak in this water for at least 30 minutes. 3. Repeat 2 or 3 times a day, depending on the severity of your symptoms. Chamomile is another useful remedy for jellyfish stings. Its anti-irritant and anti-inflammatory properties soothe the skin, relieve itching, reduce inflammation and promote healing. It is as effective as hydrocortisone, the main active ingredient in topical steroid creams that doctors recommend to treat jellyfish stings. · Make 2 cups of chamomile tea and keep it in the refrigerator for 1 hour. Soak a washcloth in this cool tea, then place it on the affected area. Allow it to sit for 10 minutes. Do this a couple of times a day for a few days. · Alternatively, add 4 or 5 drops of chamomile essential oil to 1 tablespoon of coconut or castor oil. Apply it on the affected area a few times daily. Witch hazel is an excellent remedy for relieving the symptoms of jellyfish stings, thanks to its astringent and anti-inflammatory properties. It helps ease the itching, pain and swelling. · Put a few drops of witch hazel in a cup of water. Soak a cotton ball in it and dab it on the affected area. Repeat as needed. · Another option is to use an over-the-counter witch hazel lotion on the affected area. Jellyfish typically only pose a threat to bare skin, which means that protective clothing can prevent most stings. So, when swimming or diving in areas where there’s a risk of being stung, wear a wet suit or other protective clothing. A 2009 study published in the Journal of Coastal Research reports that protective clothing for marine stinger safety is a must. The study found the fabric Lycra to be the best choice for routine-use, stinger-protective clothing. Also, opt for protective footwear, as stings can also occur while wading in shallow water.